The Rental & Staging Roadshow held its last event for 2016 in Monterey, CA, September 21st– in what was probably the most fun and most spectacular location ever for the Roadshow, thanks to the venue sponsor and Roadshow co-host Extreme Impact. The event featured not just the conference/exhibitor day but also a golf tournament on the 20th, and a day of LED training provided by NationWide. Direct-View LED training was available in an all-day session, presented by Nationwide. NationWide provides this training year-round, but this was the first time the training was available at the Rental & Staging Roadshow. The keynote for the Roadshow was presented by one of the most successful entrepreneurs in the staging world, Gary Becker, founder of Nationwide Wholesale Video, which he sold to Christie a few years back. At his keynote Becker outlined the fundamentals he's paid closest attention to, those that have led to consistent replication of enterprise growth, employee loyalty, and customer delight at the businesses he’s run. In a refreshing change from many keynotes at events, Becker focused on what should be every exec’s priority: “commitment to helping others find their way to their best." Not wringing the best from employees, but putting them on a path and in a position to find that for themselves. Bill Beck of Barco (on right), explaining some of the finer points of his Laser projector presentation, to an attendee. But will it work in a blend? Beck also pointed out performance benchmarks that have already been reached: 40,000 hour lifetime for single chip in eco mode at max output; 30,000 hour lifetime for 3 chip at max output; 24/7 operation; Longer lifetime in cooler ambient; Macro controlled dimming to 30% of max; Flexible output for custom brightness levels; Existing HDF Xenon can be retrofit with LP engine (1000 x 20klm Cinema retrofit units in the field already). Also popular at the Roadshow in Monterey: I led a Special 10th Anniversary Roadshow RoundUp: a special panel of top stagers and top gear manufacturers, where we reflected on 10 years of industry evolution, and looked ahead to the next ten years. As we’re in the middle of another industry upswing and business is good– we all agreed it’s even more important to plan now for the speed bumps ahead: buying new gear for your inventory; company growing pains; and more. Joining me in the discussion was Bret Tracey of NationWide, Franklin Moore of AV STumpfl, Don Guzauckas of HB Rentals, and Gary Becker. At the special session "Rental Management Software Issues for the Growing Staging Company", Andrew Ehler of Intellievent (standing, on left) led staging company end users in a discussion of the challenges of finding and properly implementing the right rental management software package for your staging company. 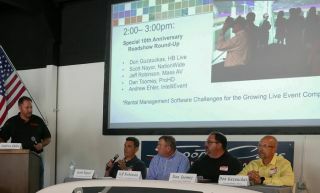 Those panelists, were, left to right at the table, Scott Nayor, NationWide; Jeff Robinson, Mass AV; Dan Toomey, ProHD; and Don Guzauckas, HB Rentals. Co-host, and Venue provider of the Monterey Rental & Staging Roadshow was Extreme Impact– maker of what is probably the best-known and most widely used rental management software in the Industry. Extreme Impact’s HQ in Monterey, CA, was the setting for the event. And it’s hard to say what was most impressive about their HQ– the fact that it’s a block from the Pacific Ocean, or that their office neighbor is one of the most prestigious purveyors of classic cars on the west coast. And in fact, the Roadshow was co-located this year with the IntelliEvent User Conference, an annual educational and networking event for current and future patrons of IntelliEvent software applications, that offers a good opportunity to meet with the team behind some of the most innovative management tools on the market today.